ARUA – The Arua Resident District Commissioner Peter Dibele has assured mourners of security at Rhino camp in Arua district during the burial of former MP Ibrahim Abiriga. 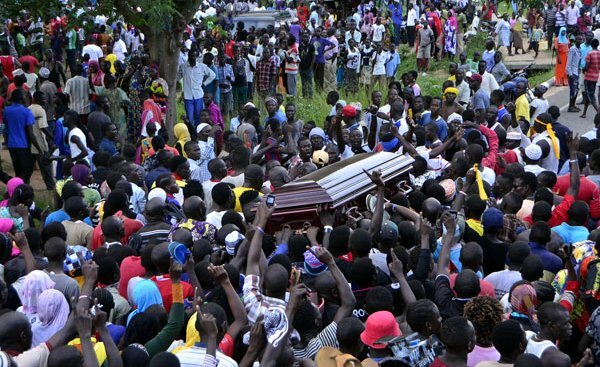 Mr Dibele’s assurances come in the aftermath of chaos that broke out in Arua as mourners received the body of their MP. ‘We have already secured the place and promise mourners that Nyafio camp will be safe for burial tomorrow. We shall not accept to be teased by these few hooligans who want to ashame Abiriga.’ stated the RDC. Chaos broke out after youth in Arua removed both bodies of the late Arua Municipality MP Abiriga and his brother Saidi Kongo from the funeral hearse and carried them on their heads to his home town in Nyafio and also tried to raid Arua police headquarters, which led to firing of tear gas and bullets to stop the acts. A lady who identified herself as a sister to Abiriga’s widow, Amina Abiriga, said they were attacked while praying at Abiriga’s home in Nyafio where the vigil was to take place and beaten for being clad in yellow attire and speaking Luganda so they sought solace at police for safety where they spent the night. The planned vigil was cancelled after a group of ‘mourners caused chaos at the place where the vigil was to take place, breaking chairs, tents and beating up people. Arua is currently said to be calm and quiet with people especially those from Kampala like journalists in fear of their lives.